Our Elite Adult Cat formula is for all breeds. 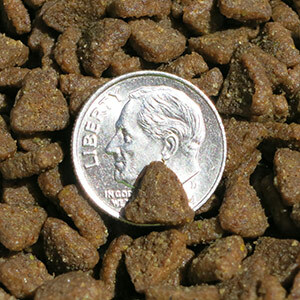 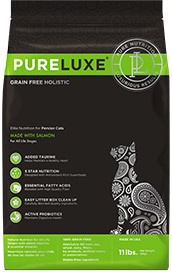 Whether your cat is indoors or outdoors this formula will stimulate his/her taste buds and provide excellent nutrition. 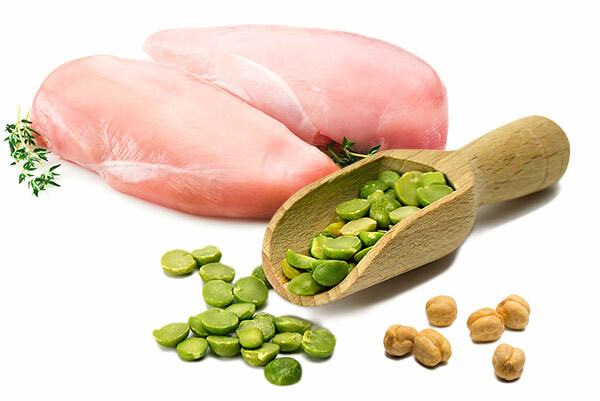 # 1 Ingredient is Fresh Turkey, 1% Omega 3 Fatty acids, 80 million cfu/lb Active Probiotics, and Ethics. Deboned turkey, turkey meal, dried lentils, dried peas, dried chickpeas, salmon meal, chicken fat (preserved with mixed tocopherols), deboned salmon, tomato pomace, flaxseed, natural flavor, pea protein (removed 8/1/18), dried cranberries, coconut oil, dried chicory root, dried kelp, salt, choline chloride, vitamins (vitamin E supplement, niacin supplement, D-calcium pantothenate, vitamin A acetate, thiamine mononitrate, pyridoxine hydrochloride, riboflavin supplement, vitamin D3 supplement, biotin, vitamin B12 supplement, folic acid), dried apples, dried carrots, pumpkin seeds, yucca schidigera extract, calcium chloride, minerals (ferrous sulfate, zinc oxide, calcium carbonate, manganous oxide, copper sulfate, iron amino acid chelate, manganese amino acid chelate, zinc amino acid chelate, copper amino acid chelate, sodium selenite, cobalt carbonate, ethylenediamine dihydriodide), taurine, mixed tocopherols, l-carnitine, turmeric, dried Enterococcus faecium fermentation product, dried Lactobacillus acidophilus fermentation product and dried Lactobacillus casei fermentation product, rosemary extract. 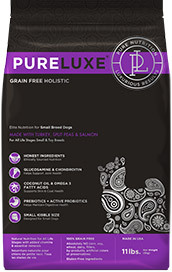 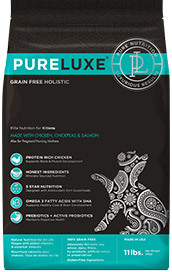 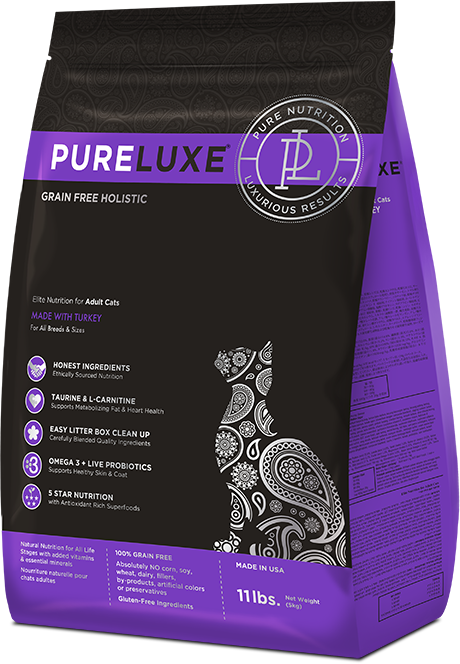 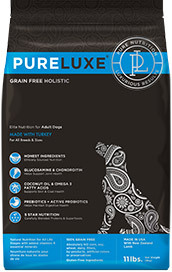 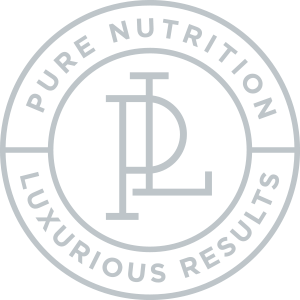 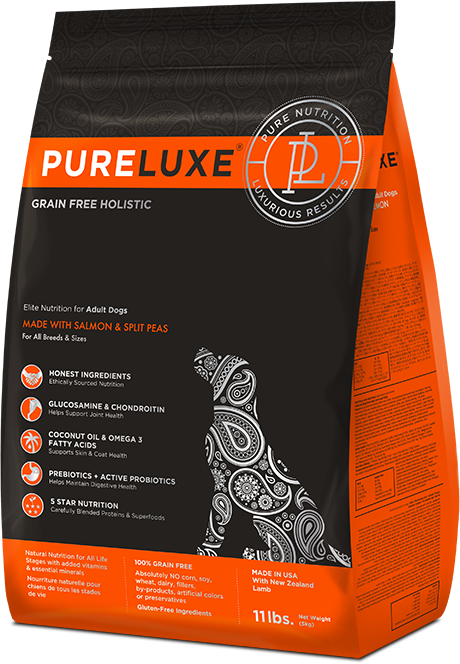 PureLUXE Adult Cat Food is formulated to meet the nutrient levels established by the AAFCO Cat Food Nutrient Profiles for all life stages.